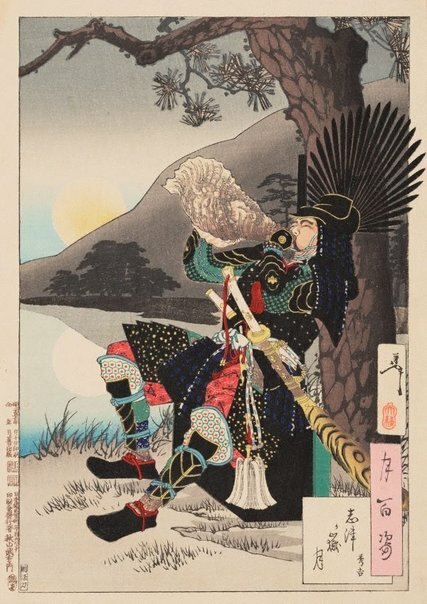 This is the second print featuring the renowned 16th-century warlord Toyotomi Hideyoshi in the series. He is shown here in full armour and wearing his impressive war helmet with the ‘sunburst’ crest. Sitting against a pine tree, Hideyoshi blows a conch-shell trumpet to signal the attack on the fortress on Shizugatake Hill. This battle took place in 1583 and was a crucial victory for Hideyoshi’s army. After this he reigned a unified Japan as the most powerful military and political leader for 15 years until his death in 1598.